Chiang Rai is a small city in the most northern province of Thailand. Chiang Rai has a rich cultural diversity due to the unique cultures from the Hill Tribes and influences of their neighbors in Burma and Laos. You can visit the famous White Temple, Black House, ruins of ancient settlements Chiang Saen City, once home to King Mengrai who united northern Thailand into the Kingdom of Lanna. Follow the opium trail as it winds down the spine of the Triangle to the West. Visit an anthropologist’s paradise in the thriving villages of the Karen, Hmong, Yao Lahu, Akha, Lisu, Shan and Lawa tribes people. 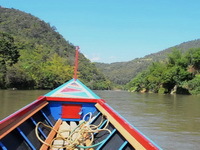 Chiang Rai is an excellent place for the tourists who want to see the real nature. The area contains of 26 waterfalls and 12 national parks. Highlight : Visit Chiang Rai is the northern border provinces of Thailand A beautiful and safe route sightseeing at the charm of the mountain north. The first hot springs at Mae Ka Chan hot spring has led people to buy eggs. the capital of Chiang Saen, the first nation on the oldest ancient Lanna kingdom. Regions Yonok Nak species. The nation’s oldest old age around 2000 years Golden Triangle. Highlight : The package tour for 3 days which combines the activities 2 days in Chiang Mai and 1 day to Chiang Rai. Highlight : The package tour for 3 days which combines the activities 1 day highlight trip in Chiang Mai and 2 days sightseeing tour in Chiang Rai. Highlight : The package sightseeing tour for 2 days with the highlight attractions and cultural in Chiang Rai. Highlight : The package sightseeing tour for 3 days with the highlight attractions and cultural in Chiang Rai. Highlight : The package sightseeing tour for 3 days which combines the activities 1 day sailing trip from Ta Ton, Chiang Mai to Chiang Rai and 2 days sightseeing tour in Chiang Rai. Highlight : The package sightseeing tour for 4 days which combines the activities 1 day from Chiang Mai to Lampang and 3 Days sightseeing tour in Chiang Rai.